Next post: Check Out What’s Up this week on KRL News & Reviews! This year the Reedley Fiesta has a new mascot, a frog named Ribberto. This week KRL took some time to get to know him. 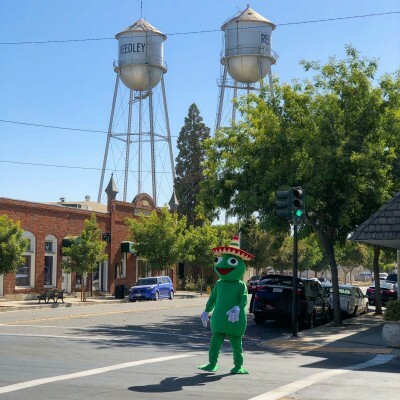 KRL: How did you end up in Reedley? Were you born here? Ribberto: I was born in a big pond outside of the Central Valley, but I have family that live in Reedley. As a tadpole, my parents would bring me here to visit. I always felt there was something special about Reedley and it captured my heart, so when I was finally able to hop on my own two feet I decided to make Reedley my home. KRL: Where did your name come from? Ribberto: Well, my birth name is Robert, but mom said that when I was small the only thing I could say was “ribbit.” Everyone thought it was super cute, so they began calling me Ribberto. The name just stuck, and I still go by that name today. KRL: What kind of frog are you? Ribberto: I am an American Bullfrog. KRL: How did you end up being so big? Ribberto: While insects are a main food staple for frogs, I had the luxury of eating the fruits and vegetables grown in Reedley. I attribute my growth to this nutritious diet. Eat your fruits and vegetables kids! KRL: I understand that you have been the star of a local web series, what was that like? How can people watch it? Ribberto: Filming the web series was a lot of fun. I had the opportunity to work with so many people from the community. To be honest, we didn’t really know what we were doing in the beginning, but the production value of the series improved as we went along. Although the series is based in truth, there is an element of fantasy that makes it fun to watch — kind of like Keeping Up with the Kardashians. You can watch the three-part series by visiting the Greater Reedley Chamber of Commerce Facebook or YouTube channel. 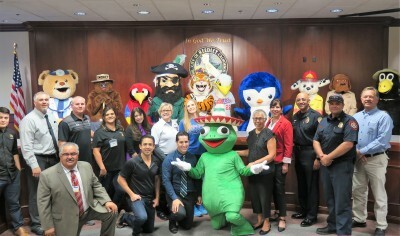 KRL: I understand you are the Fiesta’s mascot-how did that come to be? Ribberto: A Reedley College art student named Abrianna Lopez saw me in town one day and used me as the inspiration for one of her drawings. Anyhow, she posted the image on social media and it got shared by several people. The Greater Reedley Chamber of Commerce eventually got a hold of the image and began an all-out search for me. 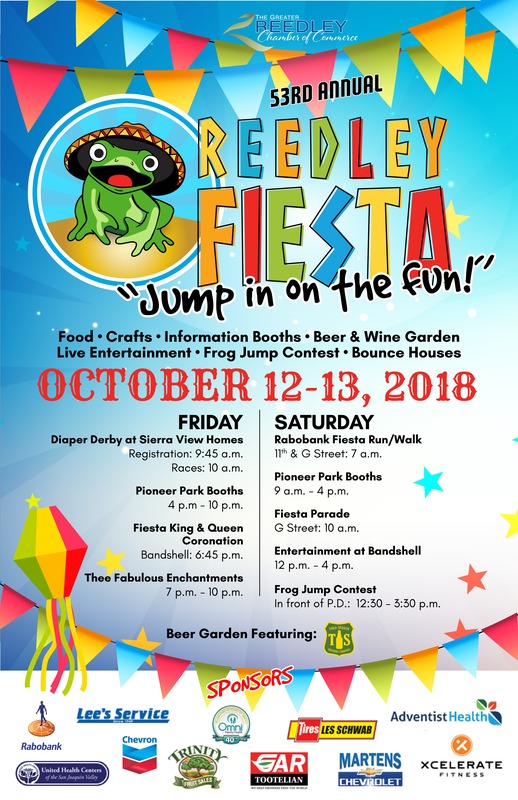 With this being the 50th year since the first Reedley Fiesta Frog Jump Contest, they thought I would make a great mascot for the event. KRL: What will you be doing at this year’s Fiesta? Ribberto: The Reedley City Council presented me with a proclamation naming me the official mascot of the Reedley Fiesta, so this year, I am serving as an ambassador for the event. 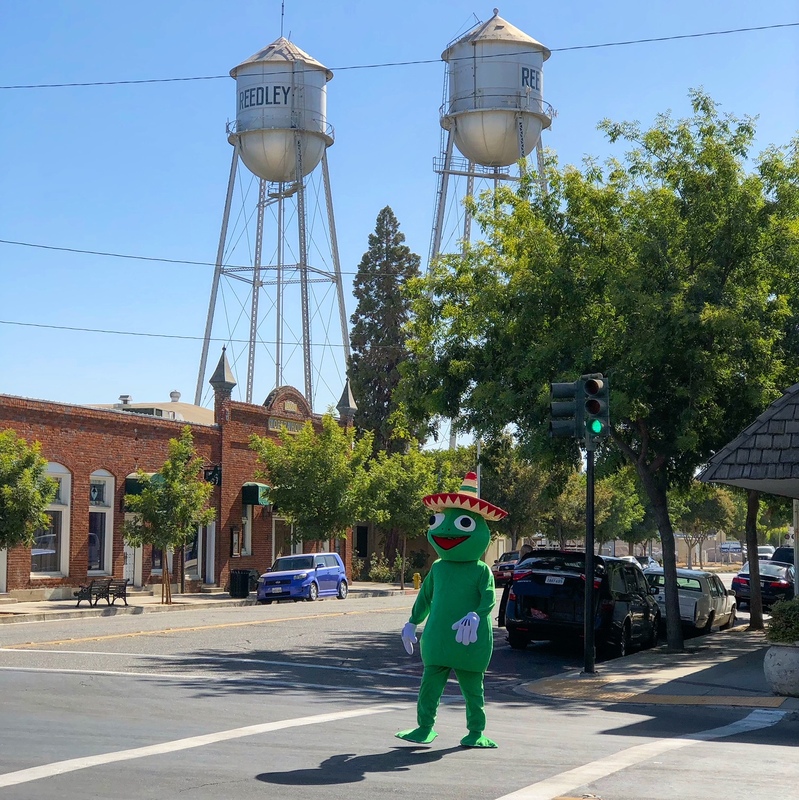 I have already made several public appearances promoting the Fiesta and I will be at several other events such as Reedley’s Taste of the Town, the Dinuba Raisin Harvest Festival Parade, and the Reedley Fire Department’s Open House. 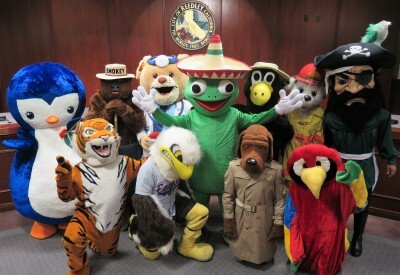 I will also be riding in the Reedley Fiesta Parade and making appearances throughout the two-day event. KRL: Will you be taking part in the Fiesta Frog Jump contest? Ribberto: I will be out there to cheer on my friends, but because of my unique size, I do not think it would be fair for me to compete. KRL: Can you tell us more about the Frog Jump contest and its history? Ribberto: I have been told that the Frog Jump Contest has been a staple event at the Reedley Fiesta since 1968. It came about when former Reedley Mayor, Gail Ball, suggested that the Fiesta needed something different. The original crew of the Frog Jump came up with the idea of a contest to see who could jump a frog the furthest. The founders of the Frog Jump were Bud Brockett, Ralph Parichans, Gail Ball, Jon Jadoon, Eddie Vasquez, Bob Lock, Robert Lock, Nick Pavlovich, and Larry Green. In the mid-80s Bud Brockett’s son, Scott Brockett took lead. Today, the Frog Jump is in its third generation of leadership led by Scott’s son, Nick Brockett. Reedley Barber, Eddie Vasquez, is the only member from the original crew to have remained active with the event every year since its inception. 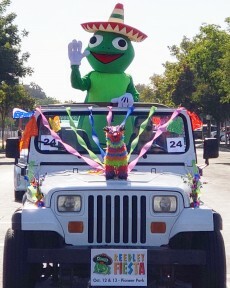 In honor of this, Eddie has been selected to lead this year’s Reedley Fiesta Parade as Grand Marshal. KRL: Will there be anything new about this year’s parade? Ribberto: I am told the parade will start with a fly over with the City of Reedley’s all-electric plane, the first all-electric plane in the nation to be certified to fly by the FFA. Also, for the first time there will be a $500 cash prize for the top awarded school float. This year’s parade theme is “Jump in on the fun” so I expect to see a lot of frogs this year. Ribberto: Being involved with this year’s Reedley Fiesta has opened my eyes to the hard work put in by so many volunteers. Without volunteers and the support of the community, this event would not be possible, so I give my thanks to them. Also, this year’s frog jump will be on Saturday, Oct. 13 at 12:30 p.m. on “G” Street in front of the Police Department. The event welcomes contestants of all ages! Great article! Ribberto is very articulate! !